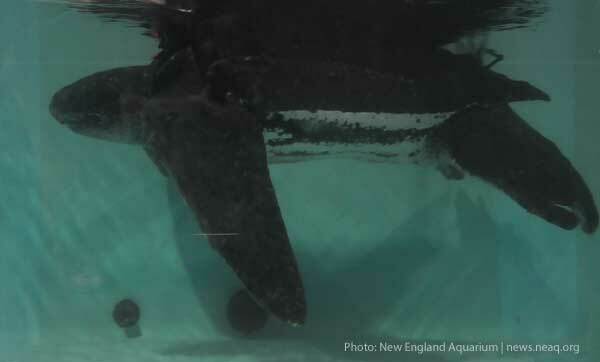 A 7-foot endangered ocean-going sea turtle, which rarely strands alive, is clinging to life at the New England Aquarium’s Marine Animal Care Center in Quincy, MA. 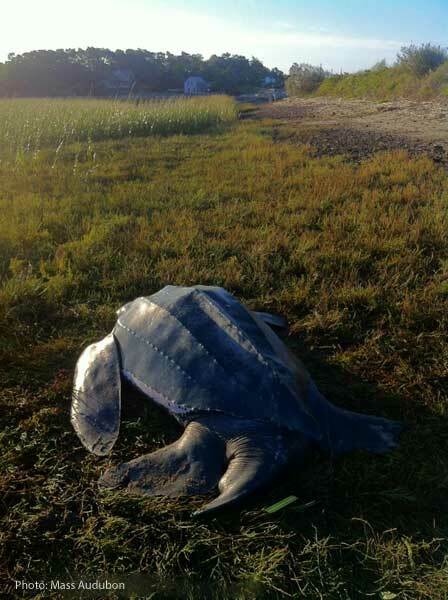 The seven foot long, 655 pound leatherback sea turtle was found just as darkness fell Wednesday night on a mud flat in Pamet Harbor in Truro, MA, near the tip of Cape Cod. Staff from the Mass Audubon Sanctuary at Wellfleet Bay located and identified the huge, black, sea-going turtle as daylight faded. Given the remote location, darkness and an incoming tide, rescue efforts were postponed until the morning. Mass Audubon then contacted the New England Aquarium’s Marine Animal Rescue Team, which rehabilitates hundreds of sea turtles each year. 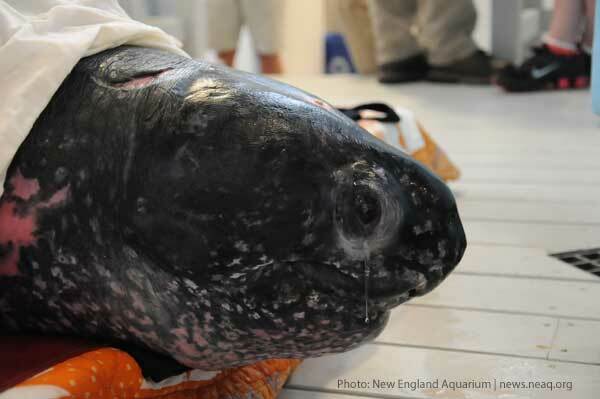 However, live leatherback stranding are extremely rare with the Aquarium only handling five leatherbacks on Massachusetts beaches in more than 40 years. Early Thursday morning, Mass Audubon staff re-located the turtle a few hundred yards from the nearest road access. With the assistance of a dolphin stranding transport cart from the Cape Cod-based International Fund for Animal Welfare (IFAW), Mass Audubon and IFAW staff with local volunteers moved the one third ton reptile to an IFAW vehicle. Thursday morning, Aquarium biologists met the rescuers on the Cape and took over care of the skinny, male turtle as they transported to the Aquarium’s new Marine Animal Care Center in the former Quincy Shipyard. There, he was evaluated by the Aquarium’s veterinarians including Dr. Charles Innis, who is one of the leading authorities on the medical care of turtles. The lethargic, seven foot long turtle at 655 pounds is actually underweight, although not emaciated. Leatherback sea turtles are among the world’s largest reptiles, and adults commonly weigh in excess of 1000 pounds. Rescue staff drew blood to evaluate the animal’s health and started administering drugs to treat it for dehydration, trauma and shock. Leatherbacks are open ocean sea turtles that migrate thousands of miles and consequently have enormous front flippers to pull their giant bodies through the water. Aquarium medical staff immediately noticed the turtle’s unfortunately distinctive left front flipper that was about a foot and a half shorter than the three foot long right one. About 40 percent of that paddle was gone due to some kind of recent trauma. Most of the wound had healed over, but Dr. Innis felt that the injury had probably occurred this season. Sea turtles often lose parts of flippers to sharks or other large predatory fish and can still survive. However, the line of the avulsed tissue on the flipper was very straight. That led some Aquarium staff to wonder if the trauma might have occurred from a flipper entanglement in a vertical line in the water such as to a lobster pot or a boat mooring. Such entanglements are unfortunately quite common and along with recreational boat strikes are the two leading sources of death for this endangered species in New England waters. Officials are still counting and double checking reports but fear that more than twenty of the endangered leatherbacks have died in the region this summer. Leatherbacks migrate up the East Coast each June to feed on abundant sea jellies (jellyfish) in Massachusetts waters, particularly around the Cape and the Islands. They will migrate south for the winter in September and October. After its intake exam, Aquarium staff wrapped a large, Velcro harness around the turtle before placing it in a large tank. The harness was attached to a rope which was always handled by a person with the mandate of keeping the turtle from swimming into one of the tank walls. Being entirely ocean going, leatherbacks never encounter barriers in the sea that they cannot swim around. The harness was designed by New England Aquarium staff as a technique to avoid further injury to the turtle. Aquarium biologists and veterinarians are working overnight and constantly monitoring the giant turtle in the hopes of trying to save it but are also hoping to learn more about leatherbacks first hand in this very, very rare opportunity. The animal’s prognosis is poor as in order to strand, it had to become critically ill. However, the New England Aquarium’s rescue and veterinary staff are among the most skilled and experienced in the world at rehabilitating sea turtles. The rescue and treatment has been covered in local media. Check out reports by NECN, WCVB Channel 5, The Patriot Ledger and The Cape Cod Times. A leatherback stranded just last year. While it did not survive, learn about the rescue team's valiant effort to save the turtle. Learn how rescue teams around New England practice disentangling leatherback sea turtles from fishing line, an all-too-common occurrence. Finally, meet a nesting leatherback our rescue team encountered in the wild during a rescue expedition to Florida. Good luck Charlie and Connie et al.!!! Amazing story, and so grateful for all the incredible and important work done by IFAW & NEAQ! Just curious about the article describing the Leatherback Sea Turtle as the world's largest reptile. Aren't Saltwater Crocodiles larger/heavier? Or is there some other factor being used to determine overall size? Thanks for your kind words, and for setting us straight. You're absolutely right, we'll correct the post. Maybe he just seemed like the biggest reptile in the world, it took a forklift to move him around! I, Maria Daddio, was staying at 38 Tom's Hill Road and found this turtle on Wednesday late afternoon while walking on the flats near Pamet Harbor with my partner and our dogs. I called Mass Audobon and reported the stranded Leatherback Turtle. Someone from Mass Audobon arrived later at Pamet Harbor and I showed them where the turtle was laying. As the sun was setting I headed back to the house and didn't actually meet the Mass Audobon staff that night. Thursday morning I was woken at 7:30am by a phone call asking to park in our driveway and saying they were going to move the turtle since they hadn't done anything the night before. My partner and I met the staff by the turtle and offered our help. I find it a bit disappointing that I wasn't mentioned in the story at all. Thank you so much for your efforts and telling your story, Maria! There have been so many institutions, volunteers, hard-working staff and supportive individuals involved in this project it's impossible to name everyone. But it sounds like your phone call set this whole effort in motion. For that we all owe you big thanks! How can we track this turtlesjourney with you? Is there a particular site or link? ?